!!! TOP 20 on Russian App Store (section Navigation)!!! 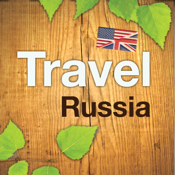 TravelRussia - the POI locator, "musthave" for any visitor to Russia. Find the location of the nearest hotels, banks and ATMs, subway stations, pharmacies, petrol stations, shops, cinemas, museums, police and post offices all over the Russia. We produced this App to let you quick and easily get the information you need at the moment. - the "rural" compass will show you the way to the object. Using this geo-content travelguide you'll easy answer the question "What's aroundme?". Just upload and stay tuned.